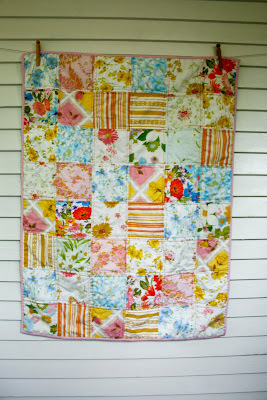 craftyblossom: vintage sheet patchwork quilt. I finally made a baby quilt using some of my vintage sheets! I actually made two, but the other didn't photograph so well, so you'll have to wait to see that one! 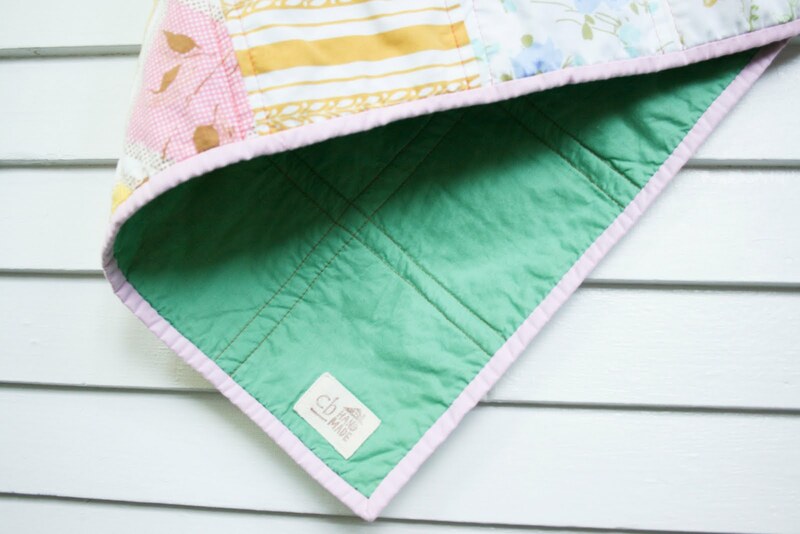 This is the softest little quilt ever. My favorite thing about this quilt is that once I finished, it felt as though these fabrics had always lived harmoniously alongside one another. A great feeling for a quilt I tell ya. Although I love it, I had the hardest time cutting into my stash of vintage sheets. Every time I chose a print to cut, I had to think long and hard about whether I'd like to use the sheet on a bed or sacrifice it for the little quilt. You see, I have this dream of having a little cottage on a lake that will be chock full of old, pretty things. Each bedroom will have no less than two twin wrought iron beds, neatly tucked with vintage floral sheets and handmade quilts. It's a reoccurring dream and it makes me happy. Soooo lovely! I love vintage sheet quilts! I'd have to have a think before cutting into them too. your quilt looks very soft! Love that striped sheet, very pretty! Your dream cottage sounds amazing! 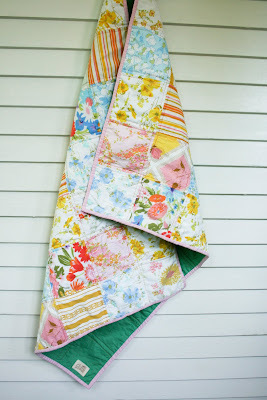 I love this quilt and have linked to this post on my blog. 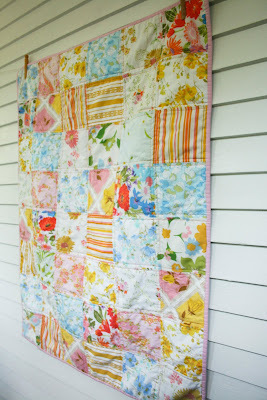 I am currently hosting a Vintage Sheet FQ swap for Australians and thought they might be inspired by your gorgeous quilt. This is so pretty! I can totally picture this quilt in your dream cottage. I especially love those reading corners. Great job putting this one together. gorgeus! i love the vintage look! yes, this cottage of yours sounds lovely. 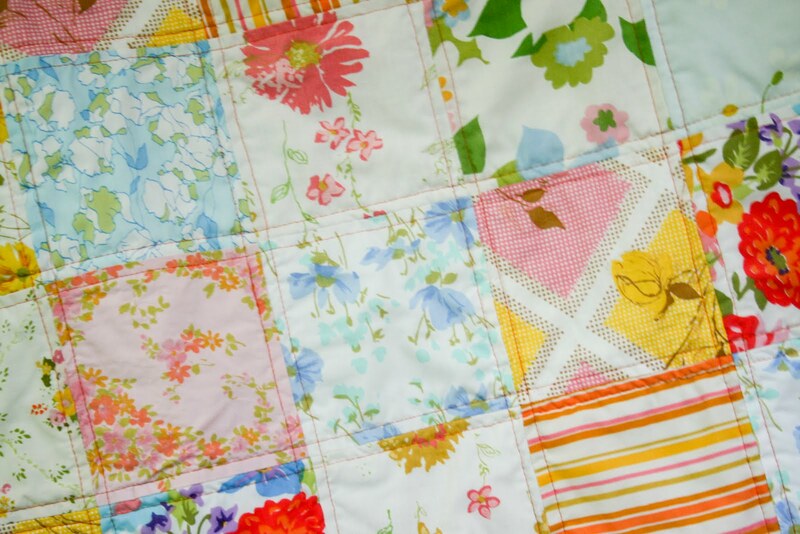 Erica, your quilt turned out beautifully - I adore it. I actually have some of the same sheets as you used! And I certainly understand how hard it is to cut into them...I have only managed to cut up one from my stash and that's because it had paint on it! :o( And I use a lot of them on the beds. Wow, your dream cottage sounds just like mine...have you been in my dreams? LOL!!! I'm a cottage girl through and through...my house is decorated in the cottage style, but I still want an actual cottage! LOVE!!!! Another adorable baby quilt from you! I was inspired by you and made a square-patch table top quilt for my friend's birthday. It was a lot of fun, but I like yours better, haha! This is lovely! 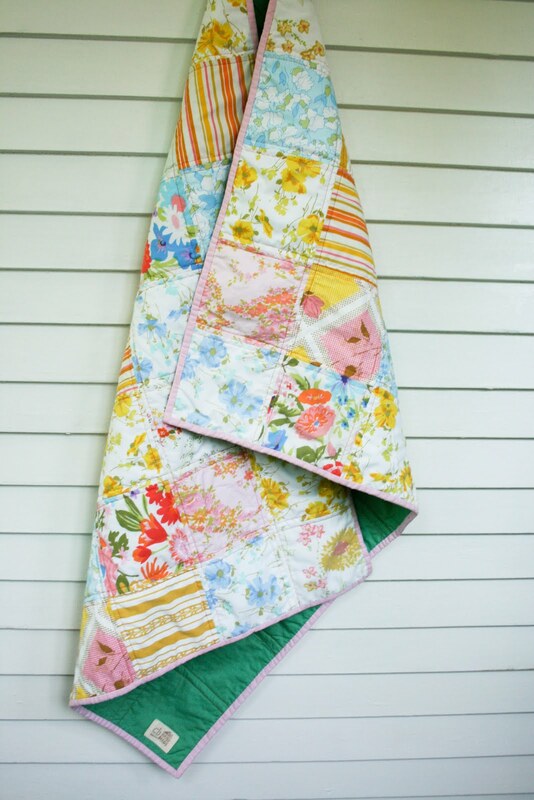 I've really been wanting to try making a quilt and this one is just so inspiring! Lovely quilt - all those happy sheets. It looks so nice to snuggle under. What a beautiful quilt - it will be most at home in your lovely little dream cottage. The story of your dream of a once and future house by the lake is as lovely as the quilt that inspired it! Love it. Love it. beautiful!!! I want one of my own, and your deam cottage sounds amazing. I have my aunt on a hunt for vintage sheets for me, yay! sounds delightful. 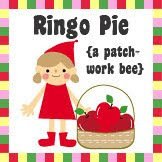 i do so love your little vintage quilt. The quilt is beautiful. I know it was hard to cut into your stash, but it sure looks worth it to me. Your dream cottage sounds delightful - and, achievable. It's a beautiful ramble--feel free to take me there, anytime! oh, it's so pretty! I just love the soft colors and cottage-y feel of this! Love it! Looks so soft!